The basic idea behind the post is Suspension of the twitter account. You account on twitter doesn’t get suspended without any reason. Twitter decides whether you are a spammer or not, and whether to suspend you or not. Don’t be on a follow spree: Its just a wish to get desirable count of followers in the beginning itself, that makes you follow loads of people on twitter. When you have very few updates and already nearing the follow limit of 2000, it can trigger an alarm to the twitter team that it can be a spam account, that always tries to do the same. Following Churn: This point was mentioned in the Twitter 101 Guide, where it said: Following and unfollowing the same people repeatedly, as well as following and unfollowing those who don’t follow back, are both violations of our terms of service. No Repeated duplicate tweets: Posting a tweet again and again, counted as duplicate tweets is often marked spammy and this again is against the terms of service of twitter. Take care while retweeting your own tweets and their frequency. No same tweets in multiple accounts: The same tweets, promotional ones, in multiple accounts can also lead to mark you as a spammer. Its easy for the spam team to filter those kind of multiple accounts which set automatic posting of duplicate accounts and suspending them. Block any doubting member: When you think a twitter user is spammy, better block him and you may minimize the risk of being marked as spammy. This was one of the reasons why my twitter account got suspended, and i was given the reason that suspension was due to some suspicions based on my followers, latest 50 of them were all spammers, making me a spammer to them. Don’t join autofollow sites: Never get into the words of those sites which promise you thousands of followers in a few days time, they are of no use and they post updates into your twitter accounts automatically. These sites getting viral for no reason, and for no use are also a spam-markers. Thanks to rmilana for the tip. Avoid always sharing links: Don’t always keep sharing links without explaining what’s it related to. Because sharing links of no use without any explanation can also alarm the spam bot. Because you might still be sharing good links, but there are many spammers who share links which load virus etc. stuff to your computer, and twitter tries to be safe from all this. Thanks to rmilana for the tip. This is a spammer: Example: Spammers have become smarter these days. Earlier it was just links posted by people who spammed on twitter, but these days they mention someone’s username and a link along with text like “hey here is a song for you” or “Title of the page” etc. and try to stay away from being called a spammer. You should be smart enough to block them and not follow them. Also, if they disturb you a lot, help twitter by reporting them as spam! Don’t autofollow: Spare some time to check which followers of yours are worth following, and follow only them. Autofollow softwares are not good. Don’t autofollow people, because if a large number of real spammers follow you, the autofollow tools does the same and the risk of your suspension increases due to suspicion. Thanks to Abhijeet @jeetblog for the tip. Automated DM’s are risky: Many people don’t like it when they receive DMs from people they follow. Especially when the DM is just a promotional one. Most of the time this is done through auto-DM tools, and many people who don’t like it would just @spam report you for doing that. I myself do that if i feel the user is DM’ing just for marketing and promotion. Thanks for Including my tips !! this is 101% guide to save your twitter account from being marked as spam !! Valuable post. Thank you for summarizing all that. My only question is about “following churn.” Following and unfollowing the same people doesn’t seem to have any point, or am I missing something? Is the idea to bring that person to the top layer of your followers with the hope of thereby attracting attention? I just stealth your exciting tips to my blog. About that,I did a major thing with my Twitter account this week. I just bulk unfollowed. So tired of spam. Good question.. many times people think that the people whom they follow should follow them back. If that doesn’t happen they unfollow and try again. This repeated things are not gone unseen but the twitter spam bots can easily get alerted about it. The above mentioned tips are really useful, and will try to follow them. 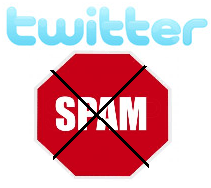 Valuable post and i thank you for summarizing all about avoiding the spammer mark in twitter.